Welcome to Issue 7 of SHAPE Journal. Firstly we would like to apologise for the delayed publishing of this issue. We hope to re-commence our intended publishing schedule of tri-weekly editions. 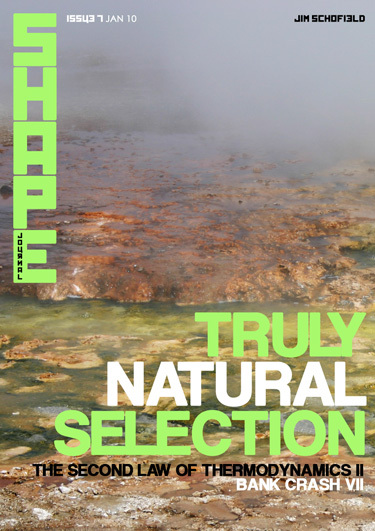 This Issue commences, as promised, with a series of papers with the title Truly Natural Selection. It is a significant theory, which extends the idea of a natural form of selection beyond its occurrence in the Evolution Of Life, to that of Reality in general. Obviously, the mechanisms which drive Natural Selection of Living Things will NOT be available prior to the Origin of Life, so quite different mechanisms would have to be involved, and these would have to be first identified, and then integrated into a conceivable selection process in those very different circumstances. Now the vital evidence that something of the kind MUST have occurred has to be the actual Origin of Life on Earth. Such a Universe shattering Event cannot have appeared out of the blue. It MUST have involved a long period of precursor processes, which could NOT be merely totally unstructured and random. The usual assumption that this significant Event happened entirely by a series of totally random chance occurrences, which is clearly nonsense. This Theory rejects that alternative, and instead reveals true Development in inanimate Matter, as a generally occurring process, which had been in train since the start of the Universe, and is STILL evident to this day via such things as Supernovae and many other similarly cataclysmic Events throughout the Cosmos. This presents an introduction to a General Theory of Development, and includes the acceptance of all Emergences as the essential interludes in such universal developments. In the following Issue we shall commence another series entitled The Superstructure and the Base, which tackles the mechanistic assumptions widely, and incorrectly, ascribed to Materialism by its Idealist opponents, which are then used to damn it as indefensible. It is an old trick, and such lightweight arguments were buried well over a century ago by thinkers such as Marx. The crucial question, which will be tackled by this author in extensive later series of papers, relate these questions to the idea of Levels emerging within developing Reality, and the relationship of such Levels (The Superstructure) to an underlying and necessary ground (The Base) The crucial point is that mechanical materialism (as these criticisms describe) has always been incapable of dealing with this question, and beating modern materialists with that “stone hammer” is wilfully dishonest and misleading. Have they never heard of the Theory of Emergences?